The University of Aberdeen are seeking a motivated and enthusiastic individual to assist staff on a Recognition Fund project working on the improvement of access, storage and documentation of the Pacific Ethnography Collections. You should be well-educated, possess practical skills and have good attention to detail. Experience in dealing with delicate material and being familiar with working in a museum would be beneficial. There will be a considerable amount of manual handling involved with this post. The post is offered on a part time basis 0.8FTE. It is underpinned by external funding and will be offered for a period of eight months. The post will report to the Curator (Collections) or Head of Museums, with day-to-day supervision by the Curatorial Assistant responsible for the project, with frequent individual contact and formal project meetings. Training and supervision will also be provided by the Museum Conservator. This post is based in Marischal College, with some meetings in Old Aberdeen. For full job details visit the website. Informal enquiries can be made to Neil Curtis by email. SPECTRUM 5.0 Consultation- Take Part Now! Help improve SPECTRUM: the UK Collection Management Standard. The Collections Trust are consulting widely to check that SPECTRUM still meets the needs of museums large and small. This will inform the next revision, SPECTRUM 5.0, to be published in 2017. They want to know whether SPECTRUM reflects current practice in your kind of museum, so please take a moment to complete the short online survey. You can also sign up to get more deeply involved in the revision process. In October 2016 I was fortunate to be able to join a two-day workshop on ‘co-collecting’ at the Research Centre for Material Culture inLeiden, part of the newly merged organisation that also includes the MuseumVolkenkunde (Leiden), the Tropenmuseum (Amsterdam) and the Afrika Museum (Bergen Dal). The event was part of a five-year partnership between ten European museums with significant ethnographic collections. Entitled ‘Sharing a World ofInclusion, Creativity and Heritage, Museums of World Culture and New Citizenship in Europe’ (SWICH) the EU-funded initiative involves a series of workshops resulting in a major conference to be held at the Museum ofArchaeology and Anthropology (MAA), University of Cambridge, in 2018. The workshop was divided into three themed sessions followed by presentations on each partner museum’s collecting policy and a final roundtable. Each of the three themed sessions was headed by a key-note speaker followed by a series of case studies. Session one, ‘Claiming Heritage – Co-collecting, Indigeneity, Citizenship and the Nation’, began with a keynote address by Joe Horse Capture of the National Museum of the American Indian. Session two, ‘Co-collecting in international / transnational perspective’, was fronted with a keynote by Sean Mallon of Te Papa and session three, ‘Co-collecting in the digital age’, by Maureen Matthews of the Manitoba Museum. It quickly became clear that co-collecting is not a singular practice. Rather than offering an ‘either/or’ option, it is all shades of grey. Examples offered included work with source communities in Greenland and Australia, the creation of a Japanese photo-booth in a Danish museum exhibition and the collecting and display of Hajj souvenirs from diaspora communities in Amsterdam. Many speakers pointed to historical precedents for what is often presented as a new, radical turn in museum practice. Nicholas Thomas (MAA) pointed to the indigenous practice of making models for 19th-century European collectors and Joe Horse Capture to the cooperative philosophy embedded in a 1972 US exhibition American IndianArt: Form and Tradition. Presenters reflected a sense of excitement to be taking up new roles of ‘facilitator’ or ‘mediator’ rather than curator, although there was an implicit suspicion of others who seek to insert themselves in such projects as consultants or advisors. Sean Mallon, in a broader reflection on traditional academic research, asked ‘do we always have to be the hero [in these activities]?’, prompting perhaps a more reflexive debate on what museum curators stand to gain from their involvement in co-collecting initiatives. Joe Horse Capture evoked the notion of the gift, asking what, in reciprocating the ‘gift’ of sharing community knowledge with the museum, is the museum ‘going to give back’? As is endemic in debates about museums’ potential to move towards a collaborative practice and to promote social justice, there was perhaps too much optimism about the transformative opportunities offered by this new regime. To my mind, all ‘radical’ museum practices should be approached with a scepticism which asks ‘why museums?’ and ‘why now?’. The symbiotic relationship between museums and nationalism, as well as their historic complicity in the national projects of imperialism and colonialism is well-established and we should remain cautious to the possibility that rather than ‘destabilising’ the museum, as Wayne Modest suggested in the roundtable discussion, ‘co-collecting’ offers just another way to shore up the authority of our institutions against the threats of instability, even possible redundancy, being posed new global and transnational forces. One of the most revealing case studies presented was by Laura Van Broekhoven (Museum Volkenkunde) and Claudia Augustat (Weltmuseum) who ruefully reflected on a tour of European museum collections undertaken by representatives of indigenous peoples of the Guapore region in Brazil. While the rushed and poorly conceived tour (organised by an independent ‘consultant’) left curators hoping to secure Guapore perspectives on their collections, or to acquire new collections material, frustrated it was evident that the indigenous peoples were able to utilise the meeting for different ends, which coincided with their own political struggles at home. Significant also was the presentation by Maureen Matthews which reflected on a lifetime of socially-engaged yet also traditionally academic research undertaken with members of the Ojibwe community. Perhaps there was no little irony in that Matthew’s relatively conventional research, conditioned more by ethics than the pursuit of social justice or ideas of co-collecting per se, had most value for her ‘subjects’. The close associations she was able to establish between individuals, objects and photographic images underpinned the community’s application for World Heritage Site designation of their region. Overall the workshop was illuminating, highlighting that however easy it is to share rhetoric amongst European museums, practice remains highly divergent. Nowhere was this more apparent than in the presentations on each institution’s collecting policies (or the absence of). 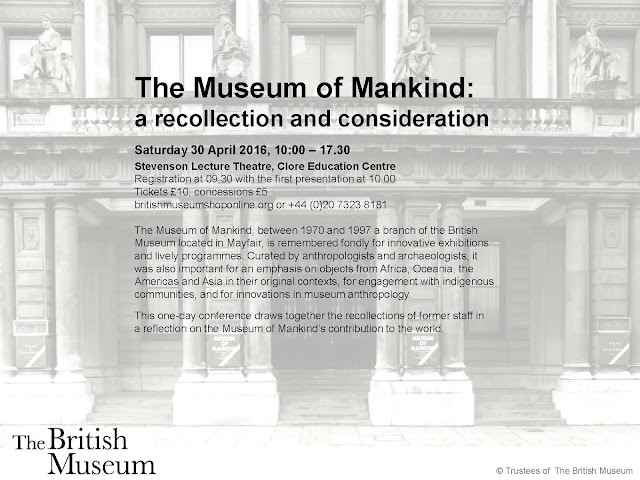 Nevertheless, the opportunity to interrogate a theme of acute relevance to museums, with the input of practitioners working at the frontline of museum ethnography, was much valued, and many thanks should be offered to the event organisers Wayne Modest, Laura Van Broekhoven and Wonu Veys.